Hours: Tuesday – Friday 8:30am – 4:30pm, Saturdays 8:30am – 3pm. Closed 12:30pm – 1pm. It’s easier for sanitation workers to handle and sort boxes that are broken down. Make sure to break down your cardboard boxes. Do not recycle cardboard that is wet or contaminated by food residue, such as grease. You can recycle clean pieces of cardboard by cutting away the soiled pieces. Remove as much tape as possible from cardboard packages. If the package is covered in a paper-backed tape, such as masking tape, the entire package can be thrown out. All types of cardboard can be recycled except if they’re coated in wax. Recycle corrugated cardboard when possible. 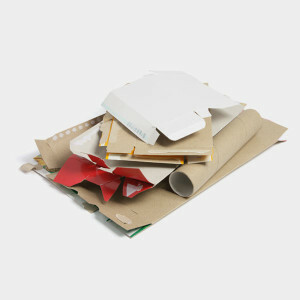 Shiny or glossy cardboard can be recycled, such as a toothpaste box. Waxed cardboard cannot be recycled, which you can identify by scratching off the wax. Going Flat: Good or Bad? Check out this short cartoon for a tip on how to recycle cardboard. About 70 percent of commercial shipping boxes that are made out of cardboard will be recycled. To be recycled, boxes are first turned into pulp, and then the fibers are separated and bleached. After these fibers are screened, they are washed, pressed and then rolled into paper.